SHADOW Chancellor John McDonnell won over the Parliamentary Labour Party last week to reject Tory plans to pass a law that would tie future governments to create a budget surplus in “normal” conditions. Previously Labour had supported this measure in order to demonstrate their commitment to sort out Britain’s persistent budget deficits, although using different means to this end. But McDonnell balked last week when Chancellor George Osborne insisted on the measure being passed without debate or any opportunity to amend it. Effectively it would tie future governments to continue with the Tories’ extreme austerity cuts. 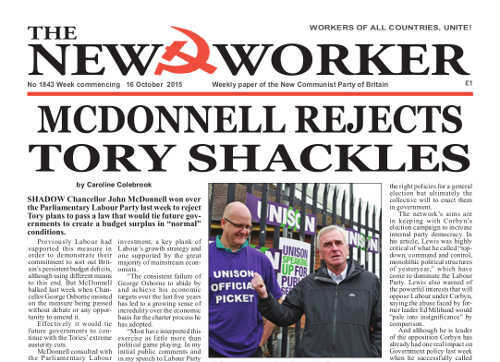 McDonnell consulted with the Parliamentary Labour Party before doing a policy U-turn. McDonnell said: “There is a significant difference between the charter and the mandate which the Labour Party agreed to support in January in that the Government’s proposal to require a continuing surplus on public sector net borrowing constrains the ability to borrow for future capital investment, a key plank of Labour’s growth strategy and one supported by the great majority of mainstream economists. ANTI-FASCISTS in London discussed the role of the western media in reporting the turmoil in Ukraine over the past two years at a meeting organised by Solidarity with the Antifascist Resistance in Ukraine (SARU) at the Marx Memorial Library in central London last Wednesday. Andriy Bondarenko, a journalist for DnipropetrovskPravda, and member of the Dnepropetrovsk regional assembly for the Communist Party of Ukraine, and Roger Annis, chief editor of the website NewCold War: Ukraine and Beyond, based in Canada, were interviewed via Skype at the meeting. Bondarenko said that under the law on “Condemnation of the Communist and Nazi totalitarian regimes in Ukraine and banning of propaganda of their symbols,” which came into effect in May 2015: “In effect it is now illegal to publicly support or promote the symbols of the communist government of Ukraine which ended in 1990. This includes even expressing support for the collectivisation of agriculture, and carries prison terms of five to 10 years. SYRIAN troops and people’s militia units have surged forward on all fronts against ISIS and the Muslim Brotherhood in co-ordination with Russian air power this week. But in Damascus two terrorist mortar shells hit the Russian embassy on Tuesday to disrupt a huge rally outside the building in support of the Russian intervention. The demonstrators had been waving Russian flags and holding up large photographs of Russian President Vladimir Putin when the shells landed. Two Syrians were injured but none of the embassy staff were hurt. Russia’s war on terror went into its second week pounding the terrorists who are financed and armed by imperialism and America’s feudal Arab lackeys. Russian aviation has been more effective in one week of airstrikes than the US and its allies have been in more than year, raising questions about whether or not Washington ever really wanted to eliminate ISIS.